Our CSA boxes right now are just overflowing with amazing produce, almost too much for the two of us to eat before it goes bad. Usually my solution for that is to make a stir-fry but then I saw Sarah at What Smells So Good's Vive Le Jardin Ratatouille & knew I had to try it. We had everything in house to make it; zucchini, eggplants, tomato, peppers & onion. The colors were amazing especially since we used a Ukrainian Orange Pepper & Turkish Orange Eggplants. I followed the recipe pretty exactly except I didn't have dried Herbes de Provence but I did have basil, savory & thyme in the garden so I used those fresh herbs instead. 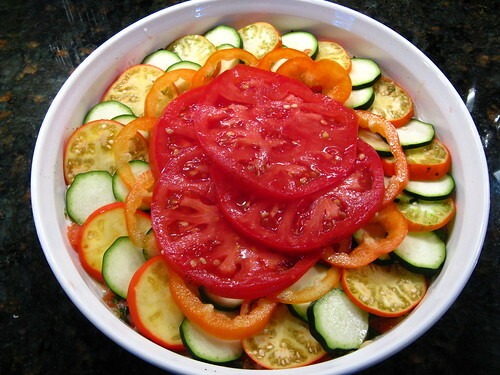 This version of ratatouille require you to do a lot less pre-cooking of the vegetables than others I've seen which is a great time saver. The flavors were amazing, especially that beautiful heirloom tomato. Everything got soft & blended together on the plate. We served ours over a bed of rice for a really filling meal. So, if you've got a crisper full of vegetables that need to be used I highly recommend you visit Sarah's site & try this recipe. Both photos are just gorgeous! Did the Ukrainian Orange Pepper and Turkish Orange Eggplants (both totally new to me) taste any different than more common varieties? I'm going to check out this recipe! The orange pepper was a lot like a yellow pepper & the orange eggplants were a little different in texture more than anything else. Fabulous use of all those lovely veggies! I can imagine the great flavors. Great presentation, too. Would love to devour w/a nice piece of crusty bread and some goat's cheese. This looks amazing. I am definitely going to try this out for myself!! Thanks for the post. Beautiful!!! I think we are all trying to use up the zucchini excess!!!! 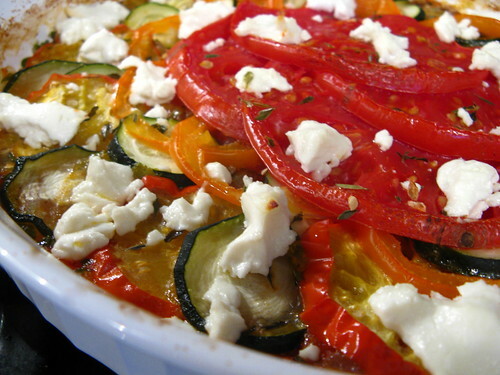 What a beautiful ratatouille! Such a great way to use up all those veggies. I have never seen orange eggplant! What an amazing colour. Those tomatoes look awesome too. i can't think of a better way to showcase all those glorious colors. nicely done! Looks like the one in the Ratatouille movie! Beautiful!